Bev grew up in Attleboro and spent summers at her family’s West Harwich cottage. She has been living and working on the Island of Martha’s Vineyard since 1980. Starting in 1985 she worked 10 years as office manager at E.C. Cottle Building Materials in West Tisbury. In 1995 Bev relocated her place of employment a mile down Lamberts Cove Rd to work with Doyle Construction. Bev handles all day to day administrative responsibilities, weekly payroll, and monthly accounts payable and billing for Doyle Construction. She is also the overall coordinator of our business development. In addition to her time working in the building material and contracting business, over the past 35 years Bev has built and sold five of her own homes on the Island, expanding her knowledge of the construction process and adding to her numerous working relationships with local artisans, contractors, suppliers, construction professionals, subcontractors and skilled craftsmen. Beverly enjoys playing tennis, gardening and cooking for her ever-growing family. 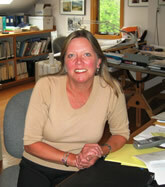 She resides in West Tisbury with her husband Michael and two of their youngest of five children. Doyle Construction on Martha's Vineyard provides quality home building, custom luxury homes, luxury home construction, custom home construction, quality renovations, additions and restorations for the island of Martha's Vineyard , MA.